Our Venison Formula is an excellent source of lean protein. In fact, pound for pound, Venison has more protein than any other red meat. It’s also low in fat, and free of toxins found in most commercially produced meats. Venison is packed with Iron and Vitamin B. And our recipes are always grain free and chicken free, which makes our Venison Formula a great option for dogs who might have food sensitivities or allergies. Not to mention dogs love the taste. Zignature® Venison Formula – Learned from Nature, Crafted to Perfection. 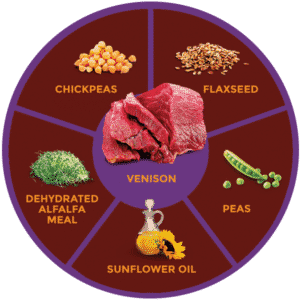 Venison, Broth, Peas, Sun-Cured Alfalfa Meal, Chickpeas, Tricalcium Phosphate, Agar-Agar, Salt, Potassium Chloride, Flaxseed, Choline Chloride, Minerals (Zinc Proteinate, Iron Proteinate, Copper Proteinate, Manganese Proteinate, Sodium Selenite, Calcium Iodate), Vitamins (Vitamin E Supplement, Thiamine Mononitrate, Niacin Supplement, Calcium Pantothenate, Biotin, Vitamin A Supplement, Riboflavin Supplement, Vitamin B12 Supplement, Pyridoxine Hydrochloride, Vitamin D3 Supplement, Folic Acid) L-Carnitine.